Sure, we could sequence copy/paste from last month and call it a day, but if we did that we’d ignore some really high quality comedy! The weather? REALLY? THE WEATHER? This is another absolutely miserable report, but don’t worry, the experts say it’s just due to the weather. Ya know, the really brutal winter… Asking people who invest real money and employ real people to believe that is asking them to believe that the winter of 2014 began in August of 2007! We certainly understand the need to spin this as best as possible for political and keep-the-rank-and-file-in-the-market reasons, but we’re here to help those who seek to exert a positive impact on the economy. We do this by offering an analysis that allows decisions to be based on reality. 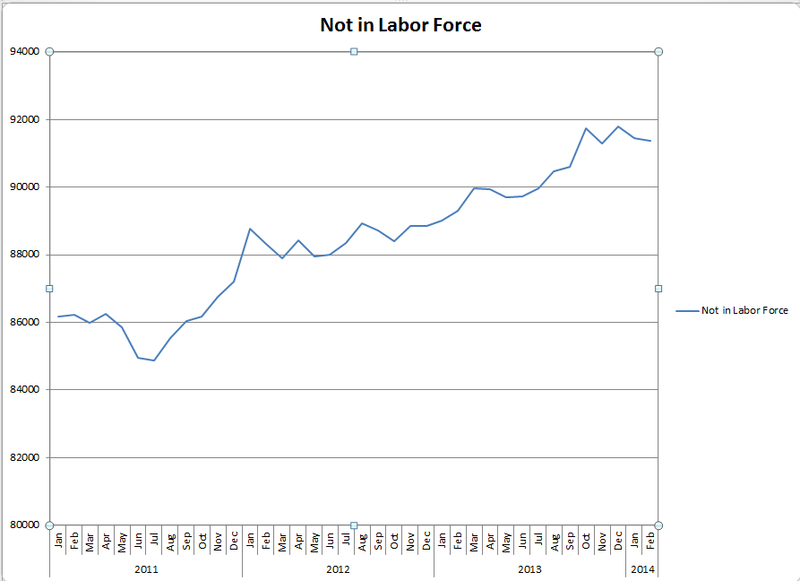 How many times can we say it – We can’t make the labor market stronger by making the labor force smaller! You just can’t beat this math phenomenon. Last month we added 145k jobs and the unemployment rate “improved.” This month we add 162k, and the rate gets worse! The “improving” unemployment rate has been due to the problem of a positive denominator outpacing a stagnant numerator. This month that was slightly reversed, as it has been on occasion, but as you’ll see in the graph below it’s the same old pattern. It continues to provide us an artificially low and misleading unemployment rate that can be utilized for headlines but has absolutely no value for investors and business managers. I know they are reporting 175k new positions, but that includes government jobs. 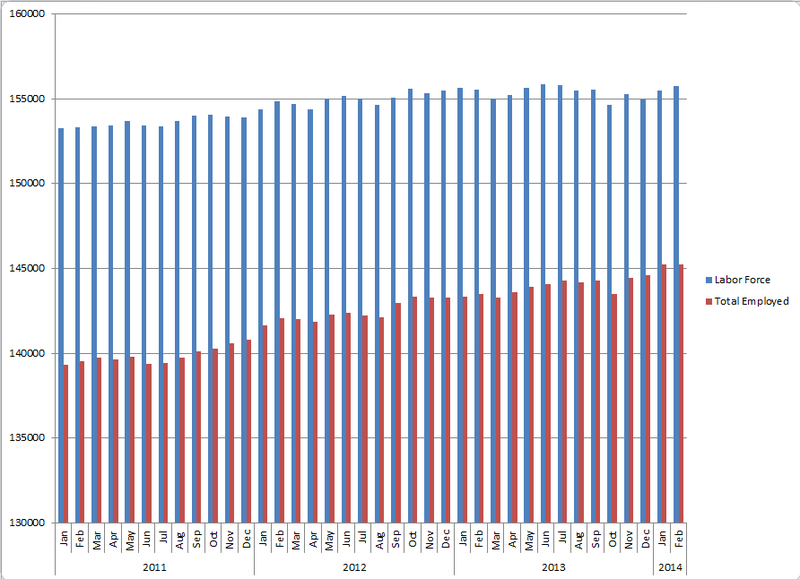 To measure the economy we only care about hires in the private sector, and there we added only 162k new payrolls. 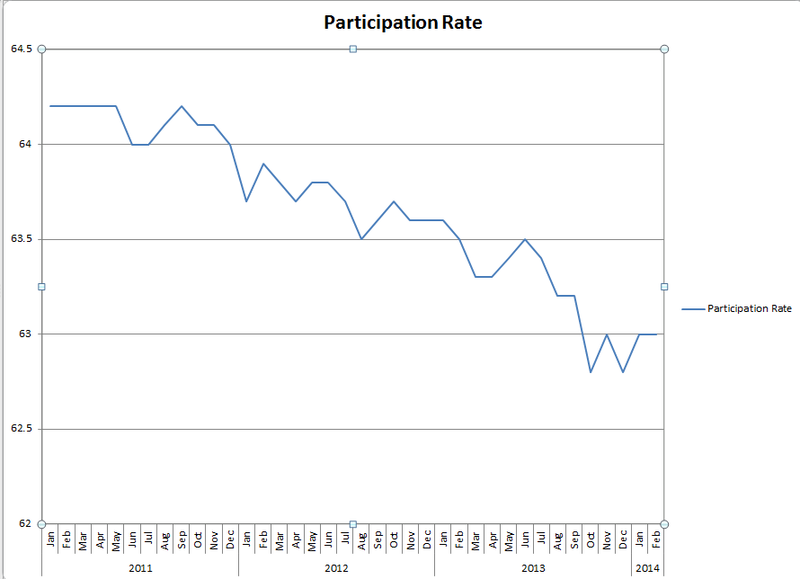 The participation rate held at 63% in February 2014 which remains in all-time record low territory. The work week pulled back and remains range bound. What struck us, however, is that it is three tenths of an hour shorter than a year ago. That’s significant. There were noticeable work week decreases in the sector-by-sector analysis including overtime hours in manufacturing, which has now been trending downward for the last four months. The largest declines were noted in construction hours, which is really the only place we can blame the weather at all. Wages remain uninspiring across the board and those who are at least 25 years old holding a Bachelor’s degree or better are unemployed at a rate of 3.4% in February 2014. That number has been on the rise of late and remains in historically unseen territory, the last six years notwithstanding. Like we always say, one report is never valuable unto itself. Trends are important. There are a multitude of other stats we could cite from this report, but they are predictable and redundant at this point. Instead we offer the following updated graphs to show what we silly non-experts already knew…nothing’s changed!